NASHVILLE — The 2019 Tennessee Sandhill Crane Festival is set for Jan. 19-20 (Saturday-Sunday) at the Hiwassee Refuge and Birchwood Community Center. The Tennessee Wildlife Resources Agency is the primary sponsor for the 28th edition of the festival and many staff members and volunteers will again be contributing their services. 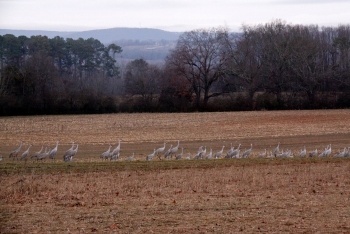 The festival is a celebration of the thousands of sandhill cranes that migrate through or spend the winter on and around the Hiwassee Refuge in Birchwood as well as an opportunity to focus attention on the rich wildlife heritage of the state and the Native American history of the area.